It looks like baseball is out, basketball is in. As dominos continue to fall from ESPN’s massive round of layoffs last week, we’re starting to get a clearer and clearer picture of what kind of coverage The Worldwide Leader has in mind moving forward. And after the news that Baseball Tonight is being essentially killed off, while Adrian Wojnarowski and his crew at The Vertical bring their NBA coverage to ESPN, there’s one obvious conclusion to draw: baseball is out, basketball is in. We don’t mean to over-simplify here: ESPN laid off people who covered every major sport. They laid off NFL reporters and racing commentators and college football writers and on and on. Hockey took a big hit as well. But the cuts to ESPN’s baseball operation are probably the most substantial. While ESPN was never particularly invested in hockey or auto racing, it has always covered baseball like a top priority. But with a cascade of layoffs, it appears America’s pastime has been demoted to the back burner. On the print side, ESPN diminished an already small beat writer corps by firing Cardinals reporter Mark Saxon and Dodgers reporter Doug Padilla, bringing them down to five or so team-specific writers. They also let go of one of their top national writers, Jayson Stark, as well as analyst Jim Bowden. Clearly, baseball will not have as large a presence on ESPN.com from now on. And on the broadcast side, the moves were even more dramatic. Analysts Raul Ibañez, Dallas Braden and Doug Glanville are gone, and their show, Baseball Tonight, is being reduced to Sundays only. During the week, ESPN will air MLB Network’s Intentional Talk on ESPN2 as its primary baseball talk show. ESPN currently pays MLB $700 million a year to televise baseball games, but given these cuts, who knows if the network will rush to re-up when that deal expires in a few years. It’s easy to infer that ESPN decision to scale back MLB coverage reflects baseball’s gradually diminishing status in the American sports landscape. As baseball loses its cultural capital, ESPN sees less reason to cover it. Basketball, on the other hand, is as popular as ever. Its audience is young, its stars are marketable and it has an outsized presence in pop culture. And as a result, the NBA seems to be where ESPN is cutting back the least. We won’t know exactly what ESPN’s NBA coverage will look like until the dust settles on Wojnarowski’s move and we see who he takes with him from Yahoo. But it figures that The Vertical imports will go a long way toward making up for NBA talent ESPN laid off: Marc Stein, Henry Abbott, Chad Ford, Ethan Strauss and others. ESPN fired a bunch of NBA staffers so it could replace them with others. 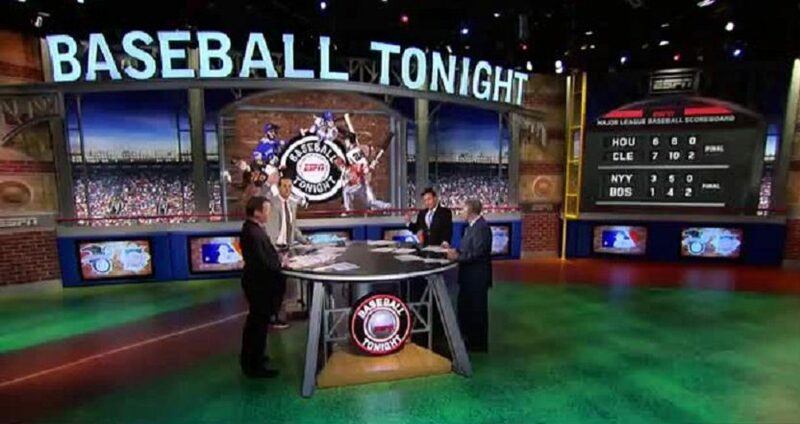 ESPN fired a bunch of MLB staffers so it could cancel their show. We’re not going to get a much clearer view of the network’s priorities than that.